Grab a blast from the past and tear a page out of time with HalloweenAdventure.com's massive selection of children's retro costumes! From the too-hip-to-be-square fifties and the bell-bottom hey days of the seventies, HalloweenAdventure.com knows retro costumes like no other costume retailer. Retro costumes are hotter than ever and it's not just the reminiscent and nostalgic adults who are seeking these righteous threads--children want to be solid in cool rags as well! We've taken the liberty of compiling a totally happenin' list of the hottest retro costumes available this Halloween. Browse through our list to get a few ideas or follow the links to other cool retro costumes to make this Halloween a totally groovy blast from the past, man! Let's start in the fabulous 1950's! For the real cool cat, we have a 1950's Poodle Cutie costume that will transport your little girl straight back to the time of soda pop and sock hops! Looking for something a little more masculine? No problem! Your little rebel without a cause will love scooting around town in our 50's rebel costume. Slick his hair back, roll the cuff of his blue jeans, and slap on our cooler-than-cool faux leather jacket to transport him back to those happy days of yore. Of course the next logical step in our journey is a trip to the trippy 1960's. 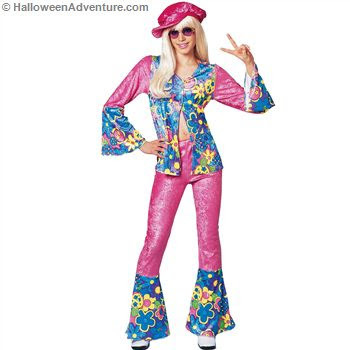 If your little one is into peace and love, then our groovy 1960's children's Halloween costumes are sure to please! From our Flower Power child's costume to our Groovy Girl costume, our 1960's costumes are sure to take your child away to another world. Let her embrace her hippie heritage or just let her get groovy with it. Either way our cool 1960's costumes promise a world of retro fun! Where would we be without the righteous disco dives of the 1970's? If your disco diva likes to party until dawn, she'll love catching the Saturday night fever in our cool Disco Dolly child's Halloween costume. The Disco Dolly costume will help your little girl hustle her way into your heart. So get ready to party in fashionable retro style this Halloween and let HalloweenAdventure.com show you how it's done. We carry a full line of retro costumes for children and adults of all ages, sizes, and preferences. Just one visit to our incredible website will prove to you why HalloweenAdventure.com is the only logical choice for all your retro costume needs!